Sams House is an historic home on Merritt Island, Brevard County, Florida. 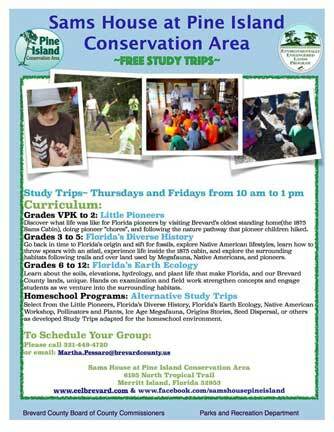 It is the Management and Education Center for the Brevard County Environmentally Endangered Lands Program's Pine Island Conservation Area. In 1875 John H. Sams built the cabin which is considered the oldest standing home in Brevard County, FL. He brought it to this location in 1878 from Eau Gallie, deconstructed, floated up the Indian River Lagoon, and reassembled here. His family, in this 600 sq. ft. cabin consisted of 4 adults and 6 children. The cabin originally had 3 rooms. It later spent time as a school, church and a workshop. They built the large house in 1888. It is a classic Florida vernacular style that accommodated a family with 8 children, some of whom were grown at the time this house was built. Sam's older brother and sister lived here too. This 1,260 sq. ft. home has two large rooms, a family room and an office on the first floor. Upstairs are three bedrooms and the bath. The kitchen was in a separate building. Until the 1930's there was no indoor plumbing, so an outhouse was located nearby. In thge 1950's part of the large porch was turned into a kitchen. The interior woodwork and exterior siding are original. Both buildings are constructed of pine. The size and shape of Florida has changed dramatically through the Millennia. At times it was only a few islands, at others, twice today's size. Here at the Sams House site we have uncovered evidence of life about 20,000 years ago, 4,000 years ago, and recent history. Take yourselves down our paths and through our houses. Explore the past in our own back yard. to some of the things you will enjoy on your visit. The Sams family came to Brevard County from South Carolina in 1875 to take advantage of the 1860 Homestead Act. The family consisted of John Hanahan Sams, his wife Sarah, their five children, John's brother William Sams, and his sister Catherine DeVeaux Sams. The Sams Homestead consists of two buildings. The first, a single story home, was originally constructed in Eau Gallie on property homesteaded by John H. Sams in 1875. The family decided to move nearer to other relatives on North Merritt Island and the house was rafted up the Indian River in 1878 to the present site. 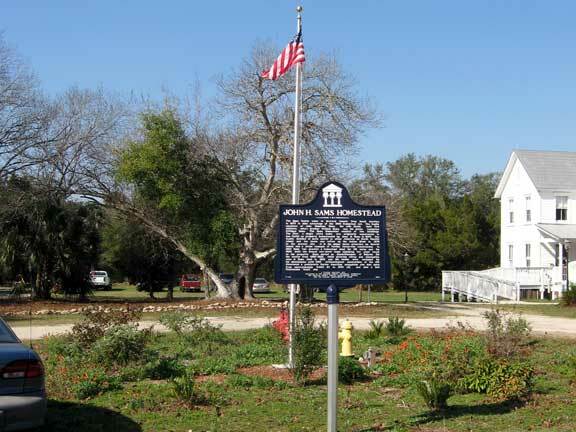 It is the oldest dated structure on Merritt Island and a prime example of Florida vernacular construction. In 1884 Sams was granted a homestead deed for 156 acres and by 1888, built the second two-story home adjoining the older house on the property. Sams served as Superintendent of Schools for the county from 1880-1920, while growing citrus and pineapples. John H. Sams died in 1923 and the homes were occupied by his descendants until 1995. Archaeological excavations at the site discovered a prehistoric Native American occupation site that dates from approximately 5,000 BC to 1250 Ad, and also a late Pleistocene fossil site. Click for active Google Map. 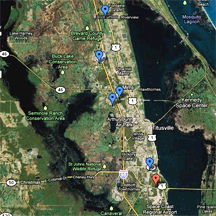 Maps to many outdoor activities in North Brevard. The Sams House at Pine Island Conservation Area was created and is managed under Brevard County's Environmentally Endangered Lands Program referendum. The referendum was established by voters in 1990 to protect and preserve the rich biological diversity of Brevard County for future generations. 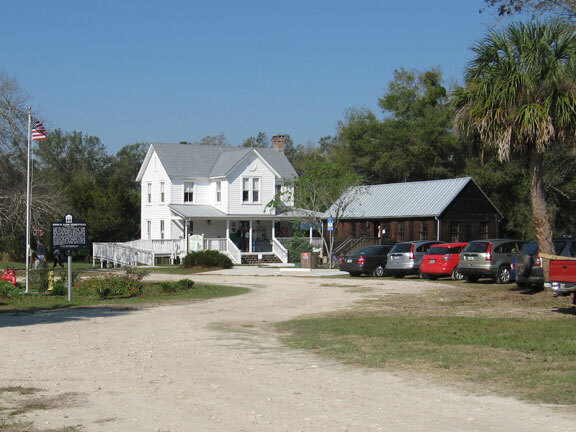 The Sams House at Pine Island Conservation Area is the Central Region location with the distinguished oldest standing structure in Brevard County and operates in partnership with the Pine Island Preservation Society. Over 8 miles of trails are available along with historical and environmentally educational exhibits and hands on learning opportunities. Admission is free, open Tuesday through Sunday 9 to 5.